I didn't often ask my dad for advice when I was younger, but had asked him about some significant decisions just before his stroke. I'll miss being able to do that. Growing up, my dad and mom were the relational gridlines that measured the world for me. It feels like all the horizontal lines have been suddenly pulled out and the vertical ones wobbled. I'm so proud of how my mom has reacted with faith and dignity in her unimaginable loss. In Switzerland, when I was six years old, my dad pointed at a mountain and said “that's the tallest”. I objected because some closer mountains looked taller. He took me behind a car, knelt down with me, and showed me how from that angle it looked taller than the microbus behind it. That was my dad – willing to come down low, not just telling but showing us God's perspective on the world – that God is higher even if closer things seem more important. In our family the worship and prayer you've come to today was not a segment of life but permeated everything – I remember my dad's daily devotions in the lounge with his Bible and journal, and us singing and praying together at home as a family, and as we drove on family holidays. Even after his stroke he was writing down Scriptures that were his strength in suffering. My parents read to us from C S Lewis and Tolkien from when we were tiny and I grew to love them and then the rest of my dad's books – Christian biographies, theology and philosophy. My dad's faith ran through his whole life – his heart and mind and strength – and was shown in his love and acceptance and care for everyone around him. 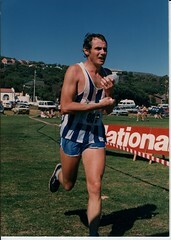 My dad was a runner. I started running only in my thirties and he was amazingly supportive – when I ran the Two Oceans Half Marathon he would drop me off, then fetch Danielle and James and Charis and find three points along the way to meet and cheer me on. He also loved taking us on walks and especially discovering new paths. This week I tried to go on one of those walks, but the way was closed off. I respect my dad for how he was always openly growing and changing, even right until the end. Like him, we're going to need to keep on growing and finding new paths to walk on. It's been so hard seeing his life cut off when we still anticipated so much. But God turns all things round for good for those who love him. I'll close with my attempt to follow up with a haiku on the season that has come.